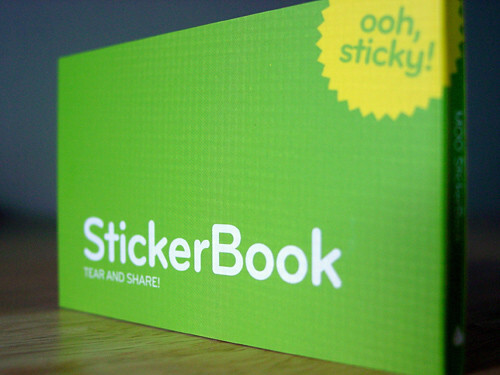 MOO introduced StickerBooks last month. I always found the cards intriguing but never enough to order any – I have business cards and don’t upload HI-REZ! photos to Flickr. But I’m a total sucker for stickers, especially 90 22mm x 22mm stickers. Being a web nerd, playing with/investigating the uploader/creation tool was much fun as well. But enough excuses. You may have heard all the compliments Moo’s confirmation emails get. Their error handling emails are even a step better. Seems there was a mix up in storing cover color information for StickerBooks. Here’s Little MOO’s explanation. I’m Little MOO. We’ve spoken before, I’m the piece of software that manages your order with MOO. I’ve done a Very Bad Thing. Don’t worry – your StickerBook will be fine, but I might’ve lost the information that tells the real life people at MOO what colour cover you ordered for your StickerBook. I might only be a piece of software but I am embarrassed and I do feel like a bit of an idiot. If you do get the wrong cover for your book, please accept my apologies and know that someone has fiddled with my insides and fixed them, and it won’t happen again. In the meantime, I hope you love the Stickers you ordered. As soon as I read the email I didn’t even care what color I was to receive. At this point I don’t even remember what color I checked. It just doesn’t matter. Thanks Little MOO. Now if only mail could get across the Atlantic a bit quicker. same goes for the moo cards. :) best 20 bucks Ive ever dropped, and so much fun to make, to boot! i guess when you told me sticker books were rad i thought you were joking…hmmmm.